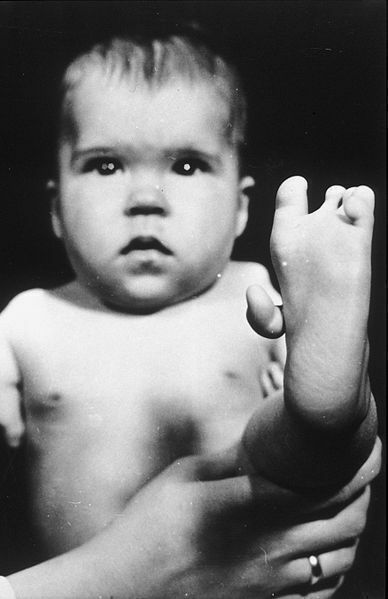 In the late 1950s, many women began giving birth to babies with severe limb defects. These babies had limbs that resembled the flippers of whales or seals — the limbs were extremely short with the fingers often protruding from the shoulder blades. Scientists coined this condition “phocomelia,” literally meaning “seal limb,” but were baffled as to what could be the cause of these debilitating defects. A New York Times article illustrates that the problem was most severe in Europe, and it was not until nearly 10,000 children had been born with this defect that the cause was determined. The problem stemmed from popular pills that pregnant women took to counter morning sickness, pills which contained a substance known as thalidomide. Soon after the harmful effects of thalidomide on developing embryos were determined, the morning sickness pill was banned. However, thalidomide is not completely out of the picture; in fact, the drug is extremely effective in curing certain skin diseases and cancers. According to an article on www.MayoClinic.com, in 1998 the FDA approved the use of thalidomide for treating skin lesions formed due to leprosy. In 2006, the FDA also approved the use of thalidomide for treating multiple myeloma — cancer affecting the blood and bone marrow. Thalidomide is especially useful as an anti-cancer therapy as it prevents the recruitment of blood vessels to newly formed tumors, thus preventing the cancerous cells from growing and spreading. The drug has proven to be useful in treating mouth ulcers of HIV patients and also as an anti-inflammatory agent. 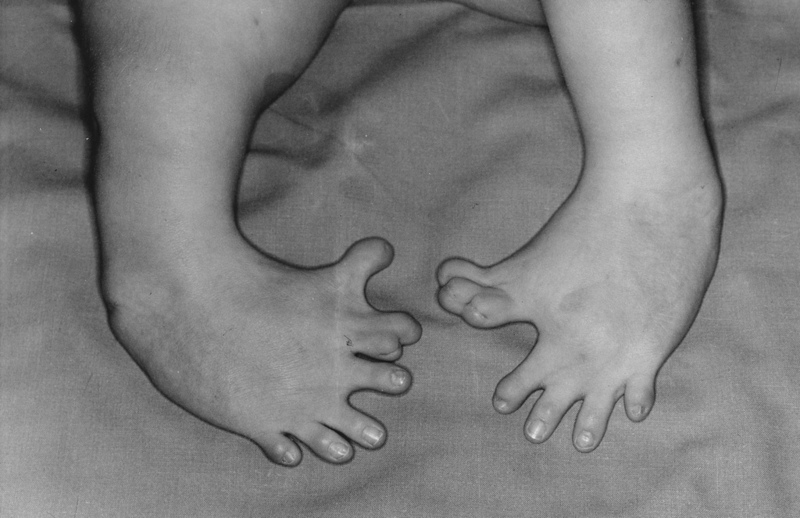 However, in spite of thalidomide’s usefulness, many still fear that its continued use will once again give rise to babies with severe limb defects. Unraveling the mystery behind thalidomide means figuring out how it can be so useful in some instances and so debilitating in others. This has been the primary focus of many researchers for some time. Researchers have been trying to create a drug that can be used as a thalidomide replacement, which will have all the positive effects of the drug but will be safer to use. The New York Times article describes that one of the major difficulties in studying thalidomide is the fact that it breaks down into 18 different chemicals once it enters the body. Out of the 18 possible chemicals that could cause embryonic defects, scientists were able to narrow the possibilities down to one chemical, called CPS49. When CPS49 was tested on chicken embryos, it caused limb defects in the developing chicks. Scientists hypothesize that CPS49 prevents the development of blood vessels — a property extremely valuable for dealing with cancer, but dangerous for the developing embryo. In the developing embryos, structures called limb buds eventually form limbs. Development from the limb buds begins later than other structures of the body. Hence, if thalidomide is taken in later stages of pregnancy, other body parts of the embryo will not be affected since the blood vessels in these parts are already formed. However, since the blood vessels to the limbs are still forming, the drug could cause limb defects. The role of CPS49 in limb defects was described in a paper published last year, but the exact mechanism by which CPS49 affected development was relatively unknown. And just a month ago, one of the major pieces of the thalidomide puzzle fell into place. According to an article published this March in Science, thalidomide is capable of binding to a protein known as cereblon, which is found in both adult and embryonic tissues. Scientists found out that preventing the production of cereblon caused limb defects in chickens and zebrafish, similar to those caused due to thalidomide. The scientists also discovered that when these organisms contained a form of cereblon that could not bind to thalidomide, severe limb malformation was not seen even after thalidomide was added to the embryos. This discovery has brought scientists a step closer to understanding how thalidomide functions in the body. However, until a replacement for thalidomide is found, it has to be prescribed with great care. Patients prescribed to take thalidomide are often advised to take birth control medications and to have frequent pregnancy tests.